There are some classics that don't hold up today -- and there are some that absolutely need to be experienced by gamers of all ages. One of those classics is the original DuckTales on the NES, which set a gold standard for licensed games everywhere going forward. I was fortunate enough to play it at launch (as well as the frequently forgotten sequel), and to this very day, it remains one of my favorite games of all time. Imagine my surprise when I found out Capcom would be working together with Disney and WayForward on an HD remake. True to form, the classic Disney character Uncle Scrooge is at it again, as he attempts to grab as much gold as he can by way of a cross-country world trip. Along the way, he'll meet a colorful cast of characters and gain some help from his friends, including classic DuckTales regulars like Launchpad and his nephews Huey, Dewey, and Louie. 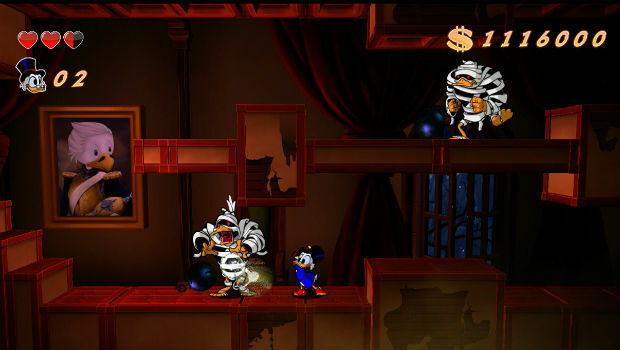 Gameplay is relatively the same as the NES original -- Scrooge is capable of a scant few abilities such as jumping, pogo jumping, and smacking objects with his cane. All of these mechanics are relatively simple to use, and you'll be hopping around on top of enemy heads and over dangerous terrain in no time. The controls are really tight, and I had very little issues working with dear old Uncle Scrooge. Bosses are no longer simple "pogo jump over and over" affairs, as they now employ a wide variety of tactics. While most big encounters are engaging and fun, a few suffer from prolonged patterns that don't do a whole lot more than drag out the battle longer than they should. This concept isn't isolated, however, as it spills over into a few of the stages themselves. One of the odder design choices in the game is the decision to create more required objectives in each stage. 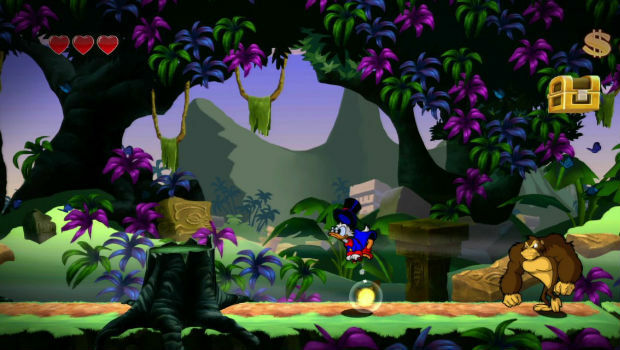 The original DuckTales is a speedrunner's dream, in that you can easily breeze through if you know exactly what you're doing and where to go. In Remastered, around half of the levels require you to explore every nook and cranny before you can beat it, which feels weird at first. Thankfully, all of the required objects show up on a pause screen map, so it's not like you're wandering around clueless, not having fun. If you're looking for a poignant, fresh set of dialog, it's probably best to not look to DuckTales for comfort. Most of the jokes are fairly juvenile, but if you watched the show, you probably wouldn't expect anything less. This emphasis on ridiculousness doesn't bother me as much as it might others, as hearing Alan Young perform Scrooge McDuck for what may be the last time is easily worth it -- not to mention that you can simply skip cutscenes if you wish. I couldn't help but smile during a number of these scenes, especially the ones involving Scrooge and his nemesis Flintheart Glomgold. Alan Young may not deliver his lines with the same gusto as he once did over 20 years ago, but he's still Uncle Scrooge to me. 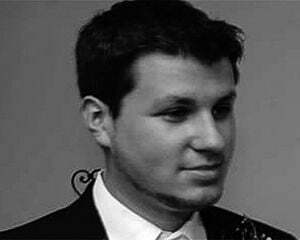 Jake "virt" Kaufman handles the soundtrack for Remastered and does a great job of capturing the spirit of the original. If anything, the score plays it a little too safe, which is great news for fans of the original (like myself) -- just don't expect something wholly new and groundbreaking (including the new tracks that were added for the two original stages). Retro fans can also turn the original 8-bit tunes on within the main menu's option screen, which is a really nice touch if you're not a fan of the remixes. The actual character art and backgrounds are absolutely stunning, and considering Capcom employed Disney artists from the show and comic, it's easy to see how they ended up that way. Some enemy models are so well defined that they barely resemble their retro counterparts, and I mean that in the most complementary way possible. But the other models in the game that aren't animated aren't as easy on the eyes -- specifically, the foreground elements like chests and items. They tend to look a bit unfinished and rushed, and the polygonal style seems especially out of place when juxtaposed to the breathtaking artwork. 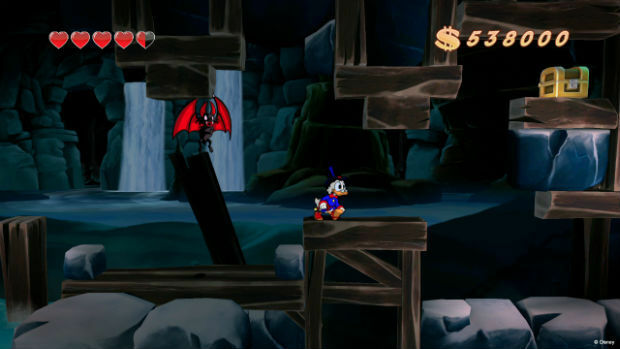 Like the NES classic, DuckTales Remastered will last you a little under two hours or considerably shorter if you've got the game down pat -- although with this new version, the aforementioned padding of some levels does make it a tad longer. To combat any issues the changes may have wrought, Remastered would have certainly benefited from a Classic mode (with zero cutscenes and fetch quests), or even the full inclusion of the classic game as an unlockable extra. In the meantime, all you have to play around with is an Easy Mode, Normal, Hard, and Extreme, with a few unlockable pieces of art and music. For those who are curious, Normal is a tad easier than the original, Easy allows for unlimited lives (which is a nice touch for newcomers), and both Hard and Extreme are actually more challenging than the NES game. Personally, I felt like each difficulty level was about on par with what you'd expect the actual description to offer.